1-YEAR WARRANTY BY PROBOATS ON LABOR FOR SERVICES RENDERED AS LISTED ON SERVICE ORDER INVOICE UNLESS OTHERWISE NOTED ON INVOICE. Warranty is valid by PRO BOATS at PRO BOAT’s service center 553 w. Covina Blvd. or by PRO BOATS Technicians at approved off-site location. If boat, engine, drive system can NOT be returned to PRO BOATS location and PRO BOATS Technicians can NOT access stated item, then with approved inspection procedures and written pre-authorization approval, warranty services may be provided at (Mercury Marine Flat Rate) by an authorized MERCURY MARINE Service Center ONLY. 1-YEAR WARRANTY PARTS & LABOR ON MERCURY MARINE PARTS; GOOD AT ANY MERCURY MARINE SERVICE CENTER THAT SUPPORTS THE MARINE ENGINE TYPE. WARRANTY REPLACEMENT OF AFTERMARKET PARTS. NO OTHER WARRANTIES ARE IMPLIED OR INTENDED. Products sold by PRO BOATS are warranted by the manufacturer. Product warranties vary per manufacturer and per product. PRO BOATS and/or its affiliates are not responsible for manufacturers warranties. PRO BOATS is not responsible for expenses involved for removal, re-installation or transportation of product for warranty repair or replacement. Products sold by PRO BOATS are warranted by the manufacturer. Product warranties vary per manufacturer and per product. PRO BOATS and/or its affiliates are not responsible for manufacturers warranties. PRO BOATS is not responsible for expenses involved for removal, re-installation or transportation of product for warranty repair or replacement. Items returned to PRO BOATS for warranty processing must be approved beforehand & have return authorization number and follow processes stated in Returned & Exchange Policy. To the extent that Goods are warranted by their original manufacturers, also to the extent that such warranties are assignable to Buyer, Seller assigns to Buyer any rights and remedies it has relating to such Goods. Buyer agrees to review and follow the manufacturer’s installation guidelines and instructions as well as policies regarding installation of unauthorized equipment. It is understood that any violation of these policies and procedures voids any applicable warranty. Seller warrants goods pursuant to the item manufacturer’s warranty policy statements, except as stated in above warranty policy statement. Seller makes no warranty expressed or implied, with respect to goods sold; including any warranty merchantability of fitness for any particular purpose regarding the administration of manufacturer’s warranty or product return policy. Failure of items not serviced or repaired by PRO BOATS within warranty period. • Any post-delivery adjustments, tune-ups, cleanings, lubrication, services done by others after client receives boat, engine, drive system and/or components. • Incidental or consequential events or charges such as but not limited to: storage, rental, telephone calls, inconvenience, loss of time or income, haul-out or towing, transportation, travel, or service calls. • Freight charges other than normal ground service unless pre-authorized by Mercury Marine. COD charges are also excluded. • Parts replaced that are not failed or were installed for test and diagnostics use. NOTE: Parts which, upon inspection, have been found to be not failed or not required to complete repairs, or were replaced without proper authorization will be returned to you. The freight and handling costs incurred will be charged to your account. Warranties may be modified, updated or revised at anytime. Mercury Marine warrants each New, Remanufactured or Certified Pre-Owned product and or accessory (not those made for high performance purposes) manufactured or sold by it to be free from defects in material and workmanship; but only when the consumer sale is made in the country to which distribution is authorized by Mercury Marine, and then only after the predelivery inspection process specified by Mercury Marine is completed and documented. B. The warranty shall remain in effect for a period of one year from the date of retail purchase. 6) Failure or damage caused by fuel deterioration or phase separation, fuel formulation, contamination, varnishing, or gumming. D. Our obligation under the warranty is limited to repairing a defective part or remedy defects in materials, workmanship or installation as covered by this warranty. The repair or replacement of parts, or the performance of service, under this warranty, does not extend the period of this warranty beyond its original expiration date. We shall then arrange for the inspection and repair, provided such service is covered under this warranty. Purchaser shall pay for all related transportation charges and/or travel time. If the service is not covered by this warranty, purchaser shall pay for all related labor and materials, and any other expenses associated with that service. Any product or accessory shipped by purchaser for inspection or repair must be shipped with transportation charges prepaid. The purchaser must provide a valid invoice listing the Services. F. Reasonable access must be provided to the product for warranty service. This warranty will not apply to: 1) Haul-out, launch, towing and storage charges; telephone or rental charges of any type, inconvenience, or loss of time or income; or other consequential damages; or 2) Removal and/or replacement of boat partitions or material because boat design for necessary access to the product. G. Parts which, upon inspection, have been found to be not failed or not required to complete repairs, or were replaced without proper authorization will be returned. H. THE IMPLIED WARRANTIES OF MERCHANTABILITY AND FITNESS ARE EXPRESSLY DISCLAIMED. TO THE EXTENT THAT THEY CANNOT BE DISCLAIMED, THE IMPLIED WARRANTIES ARE LIMITED IN DURATION TO THE LIFE OF THE SAID WARRANTY PERIOD. Ethanol for fuel is highly refined beverage (grain) alcohol, approximately 200 proof, that can be produced from natural products such as corn, sugar cane and wheat. New technology will allow ethanol to be made from “cellulosic” feedstocks including corn stalks, grain straw, paper, pulp, wood chips, municipal waste, switchgrass and other sources. Ethanol used for fuel has been “denatured,” or rendered unsafe to drink by the addition of a hydrocarbon (usually gasoline). The ethanol-blended fuel E-10 refers to fuel that contains 10 percent ethanol and 90 percent gasoline. Similarly, E-85 refers to fuel that contains 85 percent ethanol and 15 percent gasoline. E-85 is intended only for engines specially designed to accept high-ethanol content fuel blends, such as the Flexible Fuel Vehicles (FFV) made by some car companies. Ethanol is an oxygenated hydrocarbon compound that has a high octane rating and therefore is useful in increasing the octane level of unleaded gasoline. The EPA, the agency responsible for setting some of the requirements for all gasoline used in the U.S., has allowed the use of ethanol in gasoline at levels up to 10 percent as an octane enhancer and to provide beneficial clean-burning combustion characteristics that help improve some emissions. Ethanol is hygroscopic (it has an attraction for water) and will more readily mix with water than with gasoline. It has different solvency behaviors than does gasoline, which allows it to loosen rust and debris that might lay undisturbed in fuel systems. And it can more readily remove plasticizers and resins from certain plastic materials that might not be affected by gasoline alone. Loose debris will plug filters and can interfere with engine operation. Additionally, ethanol is corrosive to some metals, especially in combination with water. Although gasoline does not conduct electricity well, ethanol has an appreciable capability to conduct electricity and therefore can promote galvanic corrosion. Ethanol has a heating value of 76,000 BTU per gallon, which is approximately 30 percent less than gasoline’s heating value (which is approximately 109,000 to 119,000 BTU/gal). The result is E-10 gasoline which should yield slightly lower mileage – a decrease of approximately 3 percent. Fuels containing higher levels of ethanol will have a corresponding reduction in mileage. For example, E85 fuels produce mileage approximately 30 percent less than gasoline. The octane rating of pure ethanol (200 proof) is about 100 and is therefore useful in elevating the octane value of gasoline. In E-10 blends the presence of ethanol provides about 2.5 to 3 percent of the overall octane rating. The effect on engine horsepower is determined by the octane result of the blended fuel. Care should be taken to select fuels having the octane rating recommended for the engine as indicated in the owner’s manual for proper operation. The fuel-system components of Mercury engines will withstand up to 10 percent ethanol in gasoline – the maximum level currently allowed by the EPA in the U.S. There are some efforts to establish E-20 (20 percent ethanol mixed with 80 gasoline) for use in some areas, but that will require agreement from EPA to grant a waiver. Part of the EPA waiver process will require verification from studies that demonstrate that higher levels of ethanol do not create problems with fuel-system materials or operation of hardware. E-20 has not been extensively studied by Mercury and is not acceptable for use in Mercury products. E-85 fuels must not be used in any Mercury engines and could seriously damage current Mercury products. It is not legal in the U.S. to market any ethanol fuel as gasoline if it contains more than 10 percent ethanol. It is important to follow boat manufacturers’ recommendations when selecting appropriate fuels. Use of an inappropriate fuel can result in damage to the engine and boat components that may require repair or replacement. Fuels with ethanol can attack some fuel-system components, such as tanks and lines, if they are not made from acceptable ethanol-compatible materials. This can lead to operational problems or safety issues such as clogged filters, leaks or engine damage. If an engine is a 1990 or older model, frequent inspections of all fuel-system components are advised to identify any signs of leakage, softening, hardening, swelling or corrosion. If any sign of leakage or deterioration is observed, replacement of the affected components is required before further operation. If significant amounts of water are present in a fuel tank with gasoline that contains ethanol, the water will be drawn into the fuel until the saturation point is reached for the three-component mixture of water + gasoline + ethanol. Beyond this level of water, phase separation could cause most of the ethanol and water to separate from the bulk fuel and drop to the bottom of the tank, leaving gasoline with a significantly reduced level of ethanol in the upper phase (see Figure 1 below). If the lower phase of water and ethanol is large enough to reach the fuel inlet, it could be pumped directly to the engine and cause significant problems. Even if the ethanol water phase at the bottom of the tank is not drawn into the fuel inlet, the reduced ethanol level of the fuel reduces the octane rating by as much as 3 octane numbers, which could result in engine problems. The level at which phase separation can occur is determined by a number of variables, including the amount of ethanol, the composition of the fuel, the temperature of the environment and the presence of contaminants. (B) to limit exposure of the fuel tank to excess water. If phase separation has occurred, it is necessary to completely remove all free water from the system and replace the fuel before continuing operation. Otherwise, engine problems could occur. Follow the instructions for normal storage preparation found in the owner’s manual or operations guide. When preparing to store a boat for extended periods of two months or more, it is best to completely remove all fuel from the tank. Figure 1: Sample of fuel from fuel tank in which phase separation has occurred. The upper phase is gasoline with a reduced level of ethanol. The lower level is a mixture of ethanol and water. The purpose of this page is familiarize consumers regarding the presence of alcohol and/or water-absorbing properties of many gas additive products. Now that E10 gas has widespread distribution, many products which once were safe when used in conventional non-alcohol fuel, may now pose unnecessary risks and danger to engines running on ethanol blend renewable fuels. Ethanol alcohol, used for oxygenating E10 and E85 fuel, is a solvent, cleanser, antifreeze, readily absorbs water – Many fuel system treatment products have the same exact properties. There are many alternative names for alcohol and ethanol compounds. Carefully review ALL ingredients of fuel treatment products before use. Gumout Winter Fuel Injector Cleaner contains isopropanol alcohol 30-50%, plus detergent mixture, petroleum distillate(s) and trade secret formula. Notes: Product page states to use with every fill-up, but does not advise that will increase alcohol content over 10% when used in E10 gas. CD2 Engine Tuneup contains methanol (60-70%), Isopropanol (20-30%), 2-Butoxyethanol (10-20%) and Diacetone alcohol (10-20%). (Equal to a .75% to .8% increase in alcohol per gallon. Turbo Octane Boost 108 (North American Oil Co. and Blue Magic Company) ingredient list includes only Methanol and t-Butyl alcohol. StaBil Fuel Stabilizer: Gold eagle Co. Proprietary or trade secret ingredient(s) and hydrotreated light naphthenic distillate solvent extract (mineral oil). PRI-G and PRI-D: Power Research Inc.
Primary ingredient = Shellsol D60 (Shell Gas Company). A hydrocarbon solvent. See Shellsol description below. Also contains amines and organic dispersants. Risk of attracting and absorbing water = Very Low – Insoluble in water. Risk of attracting and absorbing water = High. Evinrude BRP/OMC 2+4 Fuel Conditioner contains 95% alcohol. MSDS includes information supporting product is not appropriate for use in alcohol blends of fuel, E10. For example MSDS states, “Soluble in water”…”Incompatibility (Material to Avoid) Strong Oxidizing agents…”, etc. Fuel-Testers Note: Ethanol is a “strong oxidizing agent” used to oxygenate gasoline. 2+4 is manufactured by Gold Eagle Co.
STP Oxygenated Gas Treatment – Most STP gas treatment products contain naphthalene – solvent naphtha, petroleum distillates, stoddard solvent, trimethylbenzenes (mixed isomers), trade secret ingredient, and other similar type chemicals. K100 G Marine Gas Treatment, K100 MD, K100 MG, and other similar K-100 products: Kinetic Laboratories Inc.
Risk for attracting and absorbing water = High – Contains alcohol. – – Comment from Fuel-Testers: K100 marine brochure and website falsely state, “Eliminates water and all water related problems, (Misleading and impossible claim)….”Stops phase seperation in E-10 fuel”, (Again, scientifically impossible claim). Ethylene glycol is an alcohol widely used as an automotive antifreeze and in the plastics industry for the manufacture of polyester fibers and resins. Naphthenic Petroleum Oil = Mineral oil, petroleum distillates, hydrotreated light naphthenic. N-Butyl Alcohol: A petroleum hydrocarbon and additive solvent. Also known as 1-Butanol, n-Butanol and Propylcarbinol. It is commonly used as a solvent for fats, waxes, shellac, resins, gums, and varnish. Soluble in water, disperses. Shellsol: A petroleum distillate, evaporating, mineral spirits type hydrocarbon solvent with a limited aromatic content. Mineral spirits are commonly used as a mild solvent, cleaning and degreasing machine tools and parts, and paint thinner or alternative to turpentine. Especially effective in removing oils, greases, carbon, and other material from metal. Mineral spirits may also be used in conjunction with cutting oil as a thread cutting and reaming lubricant. Also referred to as a white spirit or stoddard solvent. Insoluble in water. 2-Butoxyethanol is an organic solvent and glycol ether, frequently found in cleaning products. It is difficult for consumers to know whether a product contains this chemical because manufacturers are not required to list it on the MSDS. Review the wording and letters of each ingredient listed on the MSDS and package label. Many alcohol (ethanol type) chemical names end in “ol”. E.G. ethan”ol”, methan”ol”. Sometimes the common name of alcohol based ingredients is not so obvious. The product information listed above is not intended to give advice or recommendation for gas treatment or fuel additivive products. Our primary intention is to make you more aware of the ingredients products contain, so you can make an informed decision if the product is suitable for use with E10 or E85 ethanol alcohol gasoline blends. Information listed below was obtained from public sources, including official MSDS, scientific literature, research and journals, product company’s brochures and website. Some companies that manufacture and sell fuel treatment products are using deceptve marketing tactics, to convince you that they have a product which will “prevent and fix” all ethanol-related fuel problems – No such miracle product exists! The only product we have found that can safely and effectively remove water from E10 gasoline is Hydroburn by Cim-tek petroleum equipment company. Advanced fuel purifying equipment (costly) can also remove water from contaminated gas. Gas contains hundreds of chemicals and compounds – All added by the fuel companies to provide the best quality of gas possible. Gasoline sold to the public contains stabilizers, preservatives, dyes, oxygenators, octane enhancers and much more. If there was product or chemical which could simply prevent all the negative side-effects of ethanol in fuel, the major gas companies would already be adding it to the gas produced. PROBOATS has in-stock all the items you need to Prep For Storage. Come in store to purchase or call us at 855-537-6757 & we can ship to you. IMPORTANT: MERCURY MERCRUISER STRONGLY RECOMMENDS THIS SERVICE SHOULD BE PERFORMED BY AN AUTHORIZED MERCURY MERCRUISER DEALER! The following are procedures done by Pro Boats to prep your boat for storage. WARNING: Fuel vapors can be present in the engine compartment. Avoid injury or power package damage caused by fuel vapors or explosion. Always ventilate the engine compartment prior to servicing the power package. It is advised you refer to the proper Mercury Marine Mercruiser service manual before starting the following. Fuel tanks should be drained as low as possible and gasoline stabilizer for marine engines added to any fuel remaining in the tank. Flush the cooling system; attach flush kit to drive unit and run engine for 5 to 8 minutes at idle to 1300 rpm. This is especially important if the boat has been operated in saltwater, brackish, or mineral laden water. Run the engine with/fogging oil mixture to protect internal engine components from rust during any extended storage period. Per Mercruiser Service Manual; Use remote fuel tank mix 87 octane fuel, Premium Plus 2-cycle oil & fuel stabilizer; (Ratio 1.2 gal:13 oz:1 oz). IMPORTANT: Follow Mercruiser Service Manual instructions in detail and heed warnings. Drain all of the water from the engine block, manifolds, and water pumps. Remove hoses if necessary to ensure complete draining. Be sure that you clear any sediment from small drain hole passages (use a piece of wire if necessary to clean the holes). WARNING: The fuel injection system is pressurized. Avoid serious injury from an explosion. Use care when removing water separating fuel filter. Allow engine to cool down before removing the water separating fuel filter. Also, hold a clean shop towel over the water separating fuel filter when removing it, to avoid fuel spraying on the engine. Inspect the belts and hoses, and replace if worn or damaged. Check the antifreeze protection level of the coolant, if so equipped, and replace as necessary. For inboards, check transmission fluid levels, replace filter (if so equipped) and fill or replace fluids as necessary. Inspect the spark plugs for damage, and replace as necessary. For GM EFI and 8.IL/496 big block engines, replace the IAC filter. Clean exterior of the engine to prevent rust; use engine cleaning solvent, and wipe dry. If paint has chipped or scratched off, clean the affected area, prime, and repaint. For long term protection spray engine with Mercury Corrosion Guard. Place drain pan under gearhousing. Carefully remove drain plug from gearhousing and allow a small amount of oil to drain into pan. Install drain plug, be sure gasket is on plug. Inspect oil for water contamination. If water is present call a Mercruiser Dealer for assistance. 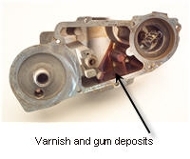 Grease drive coupler, gimbal bearing and zerk fittings on drive unit (per Mercruiser Service Manual). If the boat is stored on a trailer, leave the boat drain plugs out, and raise the bow higher than the stern. Sterndrive unit should be stored in the full DOWN position. Universal joint bellows may develop a “set” if unit is stored in a raised position and may fail when unit is returned to service. Follow the battery manufacturer’s directions for battery storage. Charge batteries and disconnect. Wash boat hull inside & outside and trailer completely. If trailer is equipped with surge brakes, check fluid level and inspect for moisture contamination. As there are a variety of Mercury Outboard Engine Systems. It is recommended you go to www.mercurymarine.com and click on “Maintenance Resources” then select your engine type. If you have questions, call us and we will assist you.